Due to their morphological and clinical-biological particularities, the occlusal surfaces benefit from a special therapeutic management. Modern preparation of the cavity surfaces may be carried out with air abrasion devices or aerated salt powder polishing devices (Prophyjet). The adhesion of composite resins is obtained nowadays with 7th generation monocomponent selfetching agents whose marginal sealing nevertheless proved to be inferior to the one obtained by the application of the adhesive system in 3 separate times. 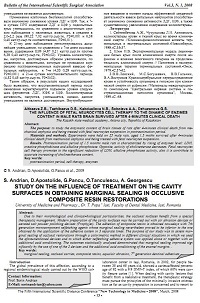 The purpose of our study was to assess marginal sealing of occlusal restorations through a colorimetric method in different clinical situations in which we used the afore-mentioned devices and to which either selfetching adhesive system was applied alone or together with an additional acid conditioning. The outcomes statistically analyzed demonstrated that marginal sealing improved significantly by the use of one of the 2 devices and the additional acid conditioning of the enamel margins. Christensen GJ. Tooth sensitivity related to class I and II resin restaotation. JADA 1996; 127, 4: 495-498. Guirguis R, Lee J, Conry J. Microleakage evaluation of restora tions prepared with air abrasion. Pediatr Dent 1999;21(6):311- 5. Hannig M, Femerling T. Influence of air-abrasion treatment on the interfacial bond between composite and dentin. Oper Dent 1998;23(5):258-65. Ellis RW, Latta MA, Westerman GH. Effect of air abrasion and acid etching on sealant retention: an in vitro study. Pediatr Dent 1999;21(6):316-9.